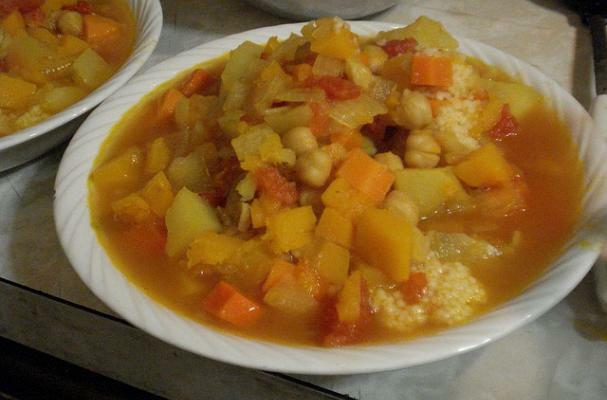 Moroccan stew is the perfect winter meal. It is warm, satisfying, and full of flavor. Chunks of brightly colored winter squash, silky tomatoes, and hearty chickpeas are cooked with aromatic spices in a comforting broth. If you can find preserved lemons, chop them and add towards the end of the cooking. You can also make them at home. Serve this delicious stew over fluffy couscous and garnish with chopped olives and toasted slivered almonds. You'll want leftovers of this meal. Heat butter and olive oil in a large pot over medium heat. Add onion, garlic, cumin, and cinnamon, and season with salt and pepper. Cook for 5 minutes, stirring occasionally, until spices are aromatic and onions are soft and translucent, about 5 minutes. Add squash and potatoes, season with salt and pepper. Cook vegetables until just tender, about 3 minutes. Add broth, chickpeas, tomatoes and their juices. Bring mixture to a boil then reduce heat to low. Cover and simmer until squash is fork tender, about 10 minutes. Remove stew from heat. Serve over couscous garnished with cilantro, almonds, and olives.